Investing in the development of our people is crucial for expanding our competencies and ensuring that we remain competitive in a constantly evolving marketplace. 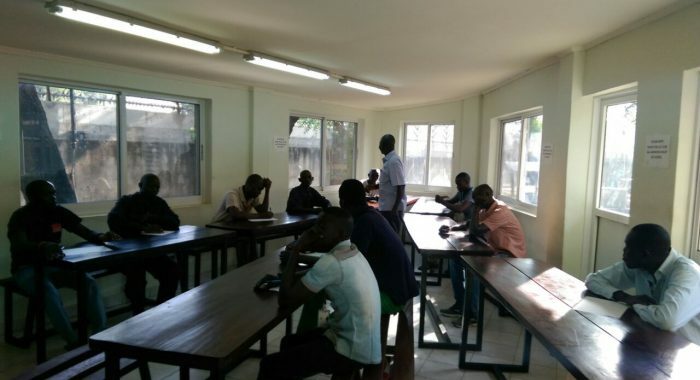 As a joint training and CSR initiative, English language classes have been arranged for selected GSS South Sudan employees. Our training partner, Windle Trust International (WTI), is headquartered in Oxfordshire, England, holding over 30 years’ experience of education and training in the Eastern African region. WTI conducted an English language assessment of 59 of our staff, and 24 most in need of English language skills, were selected to undergo the training. The aim is to have the learners reach a functional level, especially those working on the USAID contract. A variety of training approaches are utilized by WTI trainers to encourage participation. This includes a communicative and learners-centered approach encouraging interaction by using the language in realistic situations. As such, audio, story-telling, video and other materials directly linked to the participant’s jobs are also used to enable them to respond and understand easily. The new Transitional Constitution of the Republic of South Sudan currently states that, English shall be the official working language in the Republic of South Sudan, as well as the language of instruction at all levels of education. This is not only a major reform in the education sector, but also for the public sector generally. English language deficiencies are perceived to be a barrier to the efficient communication between the staff, and the international residents from USAID and US Embassy. In 2015, South Sudan’s literacy rate (UNESCO) was 32%, one of the lowest in the world. The training, which kicked off the beginning of this month, will continue to take place three times a week on selected mornings, for a total of 88 training days. Currently around 60% of the local South Sudanese employees on the USAID contract are not proficient in English. Surely, this initiative will help improve their chances to access further education and training opportunities, as well as, increase their skills, performance and motivation working for the BMMI Group.